An old short bus, the kindness of strangers and a lot of hope. That's what 24-year-old Fairfielder Griffin Peterson is counting on to carry him, his sister Casey, 20, and four others safely from London to Ulaanbaatar, Mongolia when they embark July 23 on the Mongol Rally. The seed for the adventure was planted when Griffin jokingly asked a co-worker at his job in New York City if she'd be up for such an adventure. "I didn't think she'd ever want to do it. She called my bluff," Peterson said. Early on, when it was just the two of them, Peterson and Kate Mann wanted at least one more companion for the trek. Surprisingly, a 47-year-old stranger responded on their blog soon after they posted that message. Kishor Parekh wrote three paragraphs in the voice of a "pirate," indicating he ardently wanted to join the trip though admitting he had no useful skills. He came to Connecticut on Mother's Day weekend to meet the travelers, showing up with two brown bags filled with mangos. "That won us over," Peterson said. The crew, which has grown to six people, will traverse more than a dozen nations during the noncompetitive rally -- expected to attract approximately 350 participants -- in the newly conditioned bus. During a maintenance stop at Fairfield Auto and Truck, owner Bob Cryoskie became intrigued with the effort. Eschewing payment, he upgraded the bus to include, among other amenities, a stereo, flames on the side, rally lights, working flasher lights, spare tires and gas cans. Peterson estimates 100 hours of labor and thousands in parts were invested in the make-over. The vehicle had initially been purchased at an auction in New Haven for $600. "What started as a cheap bus we pretty much got off the street, they've turned into the ultimate rally machine," Peterson said. Five of the six rally participants -- Peterson, Casey, Parekh, Mann and Jamie Bergeson-Bradshaw -- were briefed by Cryoskie on what to expect and how to deal with various scenarios that might arise along the 8,000- to 10,000-mile route, which Peterson expects will take five to six weeks to complete. The sixth crew member is Robin Holmes, a 28-year-old from Paris. While the group believes Mongolia is a nice place to visit, that central Asian nation is only one piece of a larger challenge. "About 95 percent of this whole trip is the journey along the way," Peterson said. "For me, a big part of it is being able to interact with the people and the places that we're driving through." Peterson felt a school bus would help foster interaction along the way, even if the group is more "likely to get stopped more by police" or "might take longer to get through borders." A recent addition to the vehicle -- an over-sized mustache on the grill is certain to attract even more attention in the rally -- has also been drawing thumbs-up signs from passers-by locally. Why the mustache? "We knew we were taking the bus to Williamsburg, Brooklyn, and we just thought it would fit in better," said Peterson. "It was purely for camouflage." Peterson clearly has a sense of humor, but he is serious when it comes to preparation for the long journey. Is he worried? Sure. "But I'm also worried that when I cross 24th Street I'm going to get hit by a car," he said. "If we break down in the desert in Kazakhstan and there's no town 100 miles from us, that's part of the adventure,"
The group can't load their vehicle with every supply they's need on the rally, and none of the six are skilled mechanics, so "this is about trusting in the inherent goodness of people we're going to meet along the way," Peterson said. He said he's heard stories from others in earlier rallies about "patron saint type mechanics" who helped them, the type of guys who can get a vehicle back on the road with a "coat hangar and a roll of duct tape." In addition to the thrill of the adventure, Peterson and company plan to raise money for Room to Read, a non-profit that focuses on literacy and gender equality in education throughout the developing world, as well as the Christina Noble Children's Foundation, a Mongolian charity dedicated to helping underprivileged children at risk of economic and sexual exploitation, and also Women in India, a nonprofit founded by Peterson's mother and two other Fairfield women that provides a safe environment where they can be housed and educated. 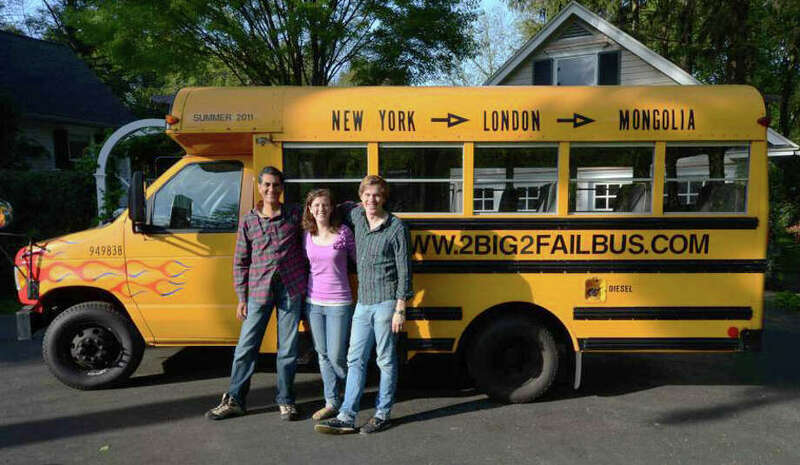 To learn more about the group or to contribute to their fundraising efforts, check www.2big2failbus.com.